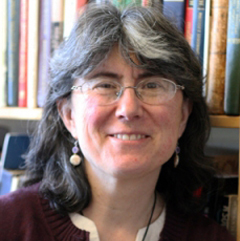 Elizabeth Wood is professor of history at MIT. She serves as co-director of the MISTI Russia Program, coordinator of Russian Studies, and adviser to the Russian Language Program. She holds a secondary appointment in MIT's Global Studies and Languages Section. The featured excerpt below is by Elizabeth Wood and was reprinted with permission of the Woodrow Wilson Center Press with Columbia University Press. RUSSIAN PRESIDENT VLADIMIR PUTIN has insisted that he and a small group of top officials decided spontaneously to invade Crimea after the departure of Ukrainian president Viktor Yanukovych on February 22, 2014. Critics of Russia and those inclined to take a Cold War perspective have claimed, by contrast, that the invasion of Crimea represents an inherently expansionist move on Russia's part, perhaps one long contemplated. A third explanation proposed by Western observers, including a number of foreign policy experts, suggests that the Russian leadership was essentially forced into taking Crimea and potentially Ukraine because of Western aggression and moves into the buffer zone around Russia. Delving deeply into the sources available on the crisis, the four chapters in this book strive to understand the roots of Russian involvement in a more nuanced way. Ultimately, the four perspectives suggest that all three claims are at best insufficient and at worst deeply flawed. The authors in this volume take different perspectives on the crisis in Crimea and Ukraine, addressing both international causes and conditions and domestic factors. Combining expertise in diplomacy, law, history, and journalism, as well as both American and Russian viewpoints, they address a number of core questions: What motivated the Russian leadership to send troops into Crimea and then declare that Crimea had formally chosen to "join" Russia? Even before actual violence broke out, what were the sources of conflict with Ukraine over European Union (EU) membership and trade in the preceding months? What domestic challenges inside Russia encouraged the Kremlin to take an expansionist stance toward Crimea? What does that expansionism say about Russian political, economic, and social priorities in this historical moment? And what role did the Russian president's personal position play in the deepening of the crisis? The EuroMaidan uprising in the fall of 2013 brought Ukrainians of many different political views together in the leading square of Kyiv to protest President Yanukovych's decision not to sign the Association Agreement proposed by the EU, as well as to protest domestic corruption and repression. The Association Agreement contained a broad number of points of cooperation between the EU and Ukraine, including agreements on economic relations and free trade; industrial cooperation; gradual moves toward visa-free movement; exchange of information, especially in legal spheres; access to the European Investment Bank; and modernization of Ukraine's energy sector. Although the protesters were not pleased with Yanukovych and made their dissatisfaction visible and audible in protests and chants, they were not initially seeking his ouster (whatever later Russian sources may have claimed). However, once the decision was made to use violence against the protesters, the stakes were raised and the protesters became much more virulently anti-Yanukovych. On the night of February 21–22, 2014, Yanukovych fled the country and his security services melted away. Vladimir Putin claimed in October 2014 and again in March 2015 that Yanukovych's flight was the precipitating event in what is usually referred to as the Russian annexation of Crimea. Certainly, Yanukovych's ouster created problems for Russia, but to most Western observers it does not explain why Russian forces would choose to invade Crimea, stage a referendum, and declare Crimea to be part of Russia. Putin's own justification has rested on claiming to "protect" Russia's "fellow citizens" (sootechestvenniki), though there is no evidence of harm to Russians in Crimea from anyone in the Maidan. In fact, there is evidence that preparations for some kind of action in Crimea began from the start of the Maidan uprising in late November 2013. Russian media immediately began broadcasting extensive anti-Maidan programs, playing on the fears of those in Crimea and eastern Ukraine. Pro-Russian groups in the Crimean parliament intensified their insistence that Crimea secede from Ukraine and join Russia. By December 12, pro-Russian forces were claiming that it was time to create "self-defense" units in Crimea and southeastern Ukraine. On December 14, the leaders of two pro-Russian groups, Gennadi Basov of the Russian Bloc and Sergei Aksyonov of Russian Unity, met with Vyacheslav Svitlychny, the Russian consul general in Crimea, and declared that they were preparing an anti-Maidan demonstration to demand Crimea's secession from Ukraine. In late January 2014, Crimean pro-Russian groups held demonstrations in several cities, burning EU flags and blaming the United States, the EU, and NATO for the crisis. The Night Wolves motorcycle band and local Cossack groups, numbering some 700 to 800, joined forces as the "Slavic shield" (slavianskii shchit), they claimed, to guard key buildings in Sevastopol. The top Russian elite now became visibly involved. On January 27–29, the chair of the Crimean parliament, Vladimir Konstantinov, met with Putin's advisor Vladislav Surkov in Moscow. On January 30, Russian Duma deputy Aleksei Zhuravlev, who had revived the nationalist party Rodina (Motherland) in 2012, announced the creation of a new "Slavic Anti-Fascist Front" (Slavianskii anti-fashistskii front). On February 3, Zhuravlev came to Crimea to hold the opening congress of this new group, which claimed to bring together over thirty different organizations, including the ROK, the Congress of Russian Communities, and Ukraine's Russian Unity political party. They listed their goals as serving as "a counterweight to the anti-constitutional, fascist uprising" in Ukraine, the defense of the interests of the Russian-speaking people of Ukraine, and the formation of public opinion for Ukraine to join the Eurasian Customs Union. In an interview on February 6, Zhuravlev explained that they had had no troubles at their opening meeting because they were already organized in Crimea in strong militias. On February 4, the Crimean parliament announced that it would seek a referendum on the "status of Crimea" and would appeal to the president of the Russian Federation for "the defense and autonomy" of Crimea. Vladislav Surkov appeared in Crimea again on February 14, and Vladimir Konstantinov traveled to Moscow again on February 19. Although no one knows what they spoke about, the presence of such high-level Russian officials, especially one responsible for policy in this area (Surkov), suggests that the Russian leaders were at a minimum closely monitoring the situation in this region and may have been involved in further agitation. No sooner had Yanukovych fled on February 22 than pro-Russian Crimeans began to hold demonstrations and form militias. In Sevastopol, a crowd of 20,000 demonstrators demanded a new mayor, Aleksei Chalyi, a Russian citizen known for his outspoken pro-Russian views. Thousands turned out in the streets of both Simferopol and Sevastopol, organized in large measure by the Night Wolves motorcyclists. Night Wolves' leader Dmitry Sinichkin, dressed in the group's trademark black leather, announced that in his view, "Bloodshed is inevitable." Chalyi and pro-Russian crowds in Sevastopol welcomed the Ukrainian secret police, the infamous Berkut, which only recently had been disbanded by the new Ukrainian government for their attacks on the Maidan demonstrators. On February 27, armed men without any evident insignia seized the buildings of the Crimean government and parliament, raising the Russian flag. A new prime minister, Sergei Aksyonov, was "elected" by the deputies who were in the occupied building. Blockades were also put in place on the Isthmus of Perekop. Russian armed forces rapidly moved in, using a wide range of groups from naval infantry (marines) to paratroopers and special operations. They came from all different parts of Russia and descended on the peninsula in a coordinated fashion. On February 24, President Putin called snap military exercises that were ostensibly in the northern and central districts of Russia, but not the southern, where Crimea is located. This was almost surely a diversion, since airborne divisions soon began traveling from Pskov to Rostov-on-Don (in the south), to set up a staging ground for shifting planes and transport helicopters for Crimea. The Syrian Express amphibious ship was diverted from its normal route to Syria to deliver 300 special forces, including the newly minted special forces that Putin had ordered in 2012, to Crimea's capital. Road blocks were set up, and transport and gunship helicopters flew in from Rostov to Crimea. In Kerch, jamming equipment was set up so the Ukrainian forces on the peninsula were unable to receive any orders from the new government in Kyiv, which in any event was barely operational after the flight of Yanukovych. By February 28, the main military actions had all been taken with barely a shot being fired. How was the takeover so bloodless? First, the pro-Russian militias and other paramilitary groups posted checkpoints and supported the work of the military, making the invading force overwhelming for the local Ukrainian forces. Second, the Russian military displayed their own high level of professionalism and training, a result perhaps of the six snap exercises Putin had called in the previous year. Thirdly, while the Ukrainian troops and Ukrainian government had expected trouble from the pro-Russian militias, they had no idea that a full-fledged invasion was imminent. Finally, under the existing agreements concerning the stationing of the Black Sea Fleet in Sevastopol, Russia was permitted to station a maximum of 25,000 troops, 132 armored combat vehicles, and 24 pieces of artillery at its military facilities in Crimea. The Ukrainian forces serving there had no reason to be surprised to see Russian troops, though they certainly did not expect that those troops would proceed to take over the government of the peninsula. The question of why the Russian government soon moved from the mostly bloodless military intervention in Crimea to the more complicated and secretive support for the "separatists" in eastern Ukraine is moot. The main theories are that (a) the success of the operation in Crimea led Putin and the Kremlin to keep going, as it were, in the hope that the population of eastern Ukraine would support military intervention because of their pro-Russian sentiments, and (b) that Russian strategists had planned this as another "frozen conflict," perhaps to punish Ukraine for its EU ambitions or to keep it from joining the EU or NATO, since countries with unresolved conflicts are not allowed to join.